Hot air balloon ride. If you take the Standard balloon flight you will usually be flying with a small group of four up to eight passengers. 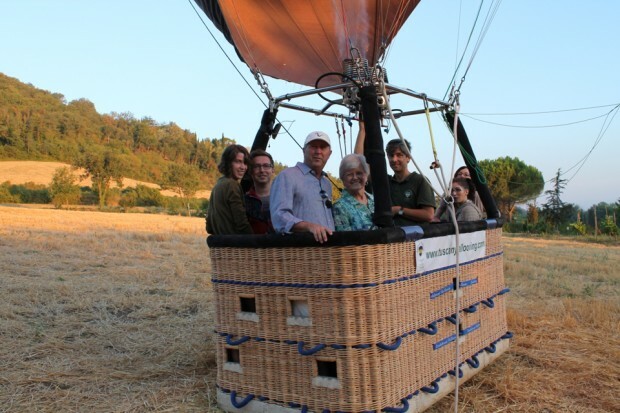 Sharing the flight and Prosecco breakfast with fellow passengers is great fun, exchanging travel experiences and pictures and the joy of flying with the balloon over the Tuscan Chianti hills. Your ballooning adventure will include an unforgettable flight of about one hour with spectacular panoramic views. After landing a traditional ballooning ‘Prosecco’ breakfast. The whole tour takes about 2½ – 3 hours. Tariff. Euro 250 per person. Children under 14 years of age receive a 20% discount. Flights are in the early morning, every day weather permitting. Flights are tightly restricted in numbers and availability and filled on a first-come basis. To check availability and to book your flight please send us a message via the Reservation Form, or just call. Floating on air in serene silence, above the beautiful countryside will be a cherished memory.. Jan S.
Hot air Balloon rides in Tuscany, Italy. Hot air ballooning in Tuscany, Florence, Siena, Chianti. Booking a balloon ride over Tuscany. 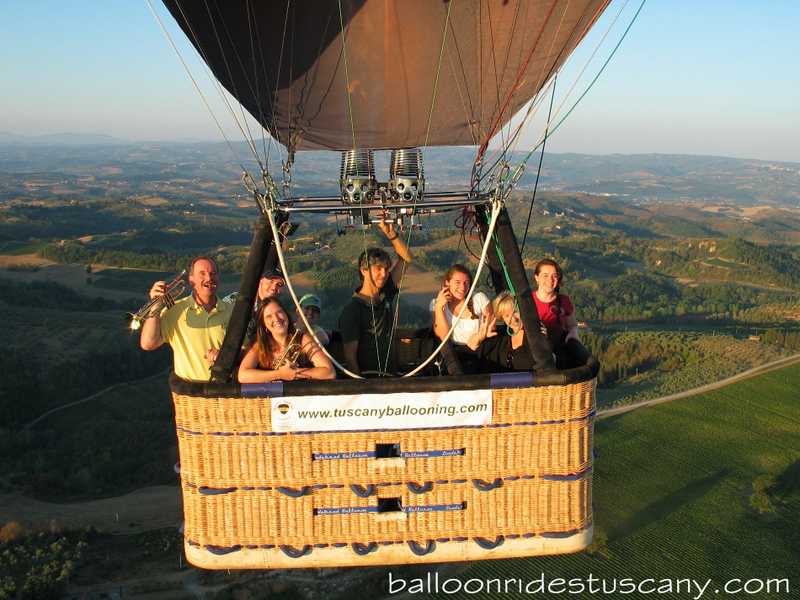 Privilege, Private exclusive VIP balloon rides in Tuscany, Honeymoon balloon flight, Anniversary. Propose in a hot-air balloon over Tuscany. Sightseeing tour, Group excursion. Corporate Team building activity. Incentive balloon tour. Large Group flights, Stunning aerial pictures. Best things to do, a special view of Tuscany, Florence, Siena, Lucca, Montalcino, Buonconvento, Pienza, Cortona, Monteriggioni, San Gimignano, Volterra. Best locations for Hot air Balloon flights over Italy. Balloon Team Italia. Best Prices and service. Fly over Chianti with Tuscany Ballooning, Booking a balloon flight in Siena. Discover Tuscany from the air! Operator Balloon Team Italia Srl. Air Operator Certificate ENAC I-148 B. © 2016 Balloon Rides Tuscany – powered by TUSCANY BALLOONING p.Iva 066810130483. San Casciano in Val di Pesa, Florence, Italy.